I’m not entirely sure how Alan Moore could disguise himself, frankly. Almost since its release, it’s been more-or-less accepted that Miracleman #15 has been the most difficult to find, which is borne out by my experience over the last few decades, as all the issues around it would regularly turn up, but not that fifteenth one. The price in the Overstreet Price Guide tends to reflect that assumption, with #15 listed much higher in value than the issues around it. So, why is this particular issue of Miracleman so hard to find? As I was about to say eariler, my personal belief for the cause of its scarcity was its hyped-up reputation for being a particularly dark and violent superhero battle, graphic and unpleasant and totally unlike anything we’d seen in superhero comics before. 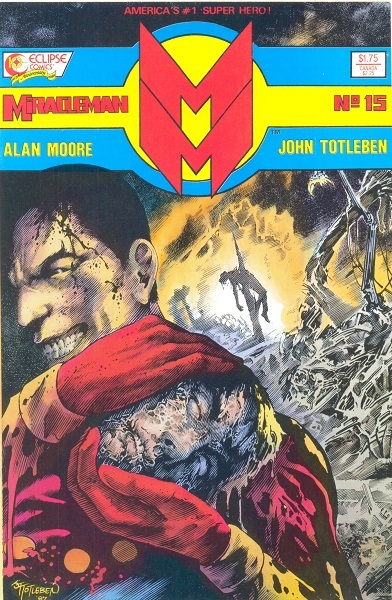 Even previous issues of Miracleman , with its moments of graphic violence, weren’t a patch on the horror so disturbingly illustrated by John Totleben. As I vaguely recollect, there was at least some promotion of the title as such in the fan press and Eclipse’s advertising, which surely attracted buyers beyond those who regularly read the title. Which brings me to another possible answer, and one that I initially replied to Tom with…that despite all the hype and anticipation, orders may have been lower than normal. Miracleman was a comic that had been plagued with delays…which may have caused retailers to drop numbers believing that lateness would affect potential sales. Remember, this was back in the day when late shipping books weren’t nearly as common as they’d be in succeeding decades, with, you know, three years between issues an’ all. Something consistently late-shipping would normally see attrition in sales, Alan Moore or no Alan Moore. Now, the problem with this assumption is that I don’t have ordering/sales records for my old place of employment at the time. I’d need to talk to my old boss and see if he can recall, but this is still 30+ years ago. What I’m working on is my knowledge is how I’d approach the problem of a late-shipping book, at least in the context of the 1980s marketplace, vs. the somewhat more lenient comics market of today. I’m sure I would have cut orders…maybe not by much (it’s still Alan Moore, at the peak of his initial Alan Moore-ness) but as someone running a store and maintaining a budget and juggling what I can afford and not afford, that’s the call I would likely have made. Now of course with 20/20 hindsight we’re all “you should have ordered a million of these and perhaps fewer of ALF #9″ but what’s done is done. Another possible answer, which has its own problems with I’ll come to in a moment, is the simple fact that people are holding onto their copies. The fact that this issue has this “mystique” about it, that it goes for a lot in the secondary market, becomes in a way a self-fulfilling prophecy. It’s hot and rare because it’s hot and rare, and folks hold onto their copies because it’s hot and rare, making it even more hot and rare, and so on. Now this is a bit trickier, because it seems like if someone is aware enough of Miracleman in the first place to know about #15’s reputation, it would seem unlikely that they would unload their other issues of the series while hanging onto the one issue. Or maybe they already sold their #15 for a premium price (like on the eBay, where there’s no shortage of them) prior to the rest of the issues being brought to us for sale. Or maybe they never got a copy of #15 in the first place, having sold out before they could get to a shop and they’re now unloading their incomplete series onto stores. Anyway, that’s just a few possibilities. I’m sure there are some I haven’t considered, like Alan Moore surreptitiously traveling from shop to shop buying up copies of #15 just to stick it to fanboys. And perhaps things are changing anyway, as, in the couple of Miracleman collections I’ve picked up since being at my own shop, #15s have been included. Maybe Marvel’s recent reprinting of the series has loosened some collectors’ grips on the originals…I even thought briefly about unloading my own run and replacing them with the reissues, though a couple of problems with the reprints made me glad I hadn’t. In conclusion… Miracleman #15…I have one for sale here at the store in case anyone wants one. Also, if you want to read more about Miracleman, I’ve definitely said plenty over the years, but Twitter pal Tom, whose blog I’d already linked above, also has his own Miracleman category you should peruse. How have prices on the original series held up since it was reprinted by Marvel? Of course, since we’re waiting for the revival to revive, have prices of the original and the reprints continued to fluctuate? From my own experience, #15 was actually the first issue I bought, and I spent much of the next year getting back issues and waiting for #16, so I looked in the Miracleman section in both the bins and the rew release racks of a lot of comic shops, and saw quite a few #15s, certainly more than some other issues of the Totleben run, but not as many as the first 10 issues. I think it was #12 that I finally had to order direct from Eclipse when all local options came up dry. After that it was harder to find. Three different people who had gotten an otherwise complete run of Moore’s issues had to borrow my copy of #15 after being unable to find a copy. Also, I wonder if the shortage of #15 in back issue bins is also a function of Eclipse’s weird up-and-down luck in the publishing field. If I recall correctly, they were going to close up shop on a number of occasions before finally going under for good. That’s entirely speculation on my part, but maybe #15 came at a rough financial time for the company and they printed-to-order instead of overprinting? We both know you would have immediately regretted under-ordering that All-Holiday issue of Alf, Mike.